How Did the Hippopotamus Get its Name and What Does it Mean in Greek? The hippopotamus, or hippo for short, got its name from the ancient Greek words ἵππος (hippos), which means “horse”, and ποταμός, (potamos), for “river”, and put together meaning “horse of the river”. The plural for hippopotamus in English is hippopotamuses, but hippopotami is also acceptable. A male hippopotamus is known as a bull, a female as a cow and a baby as a calf. 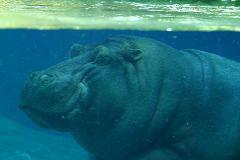 The species is also known as the Common Hippopotamus or the Nile Hippopotamus. Hippopotamuses are gregarious, living in groups of about 30 animals, and these groups are called pods, herds, dale or bloats. Hippopotamuses are the third largest mammals in the world after whales and elephants. The most recent theory suggests that the hippopotamus evolved from whales, and the group likely split into two separate branches around 54 million years ago. Why is the Hippopotamus Poached for its Teeth and How Many Hippos are Left in the Wild? How Did Plastic Surgery Get its Name, What Does Plastic Mean in Greek, and Where Did it Come From?